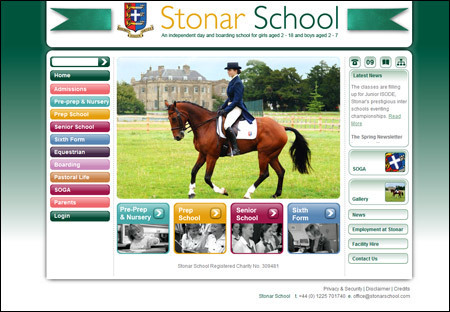 The redesigned web site for Stonar School has now gone live. Based on initial designs and colour schemes supplied by Mynt Design, the new site is now fully content managed using our SCRIBE web site management system . Stonar School situated in Melksham, Wiltshire is an independent school providing day and boarding education for girls aged 2-18 as well as boys aged 2-7. It offers a wide curriculum of subjects and has demonstrated outstanding A Level and GCSE successes, as last years results attained, with 100% pass rates at both levels.